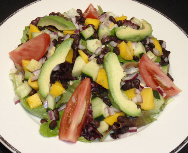 Iceberg lettuce, baby mixed greens, mango, avocado, tomatoes, cucumbers, red onions and black beans. Served with Italian dressing on the side. Iceberg lettuce, baby mixed greens, tomatoes, cucumbers, radishes, shredded carrots, jicama and avocado. Served with Italian dressing on the side. Iceberg lettuce, baby mixed greens, tomatoes, cucumbers, shredded carrots and bell peppers. Served with Ranch or Italian dressing on the side. Iceberg lettuce, baby mixed greens, tomatoes, cucumbers, red onions, kalamata olives and feta cheese. Served with Italian dressing on the side. Iceberg lettuce, rice noodles, sesame oil, sesame seeds, water chestnuts, mandarin oranges and green onions. Served with Asian dressing on the side.